Since we met at this conference last year much new evidence of manipulation of the gold market by central banks and their bullion bank agents has been compiled and disclosed by the Gold Anti-Trust Action Committee. 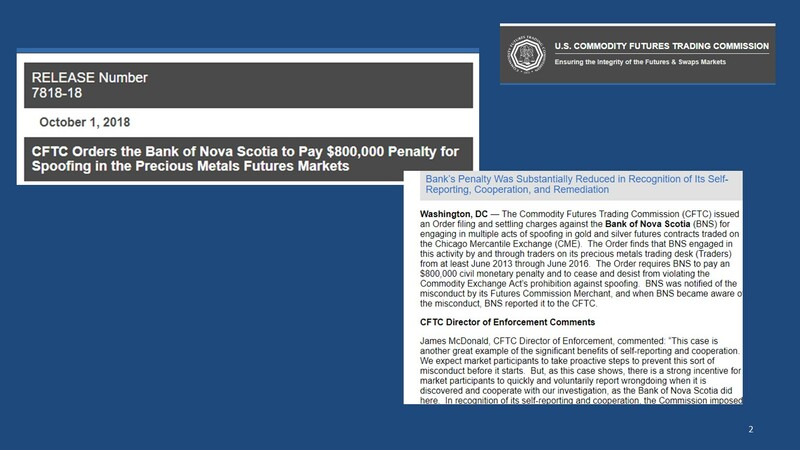 For example, a month ago a major bullion bank, the Bank of Nova Scotia, admitted to the U.S. Commodity Futures Trading Commission that it had manipulated the gold and silver futures markets from June 2013 through June 2016. Ironically, in September 2013 the CFTC had closed its long-running investigation of silver market manipulation, announcing that the commission could not find anything actionable. That was three months after the Bank of Nova Scotia now admits its market rigging began. Have you ever seen mainstream financial news organizations report that governments and central banks get discounts for secretly trading all major futures contracts in the United States, even cattle futures? Perhaps not coincidentally, the chart shows the value of the foreign exchange and gold derivatives and the derivatives for other precious metals jumps markedly in 2010 just before the seven-year smashing of monetary metals prices that began in 2011. The value of those derivatives increased steadily from 2010 through this year. So who are these commercial banks and savings associations and what are their connections to the U.S. government? Are they, for example, lots of community institutions like the famous Bailey Bros. Building & Loan of Bedford Falls, New York in the 1946 movie that romanticized locally based banking, "It's a Wonderful Life"? Or are they mainly primary dealers in U.S. government securities, banks that are formally agents of the Treasury Department and Federal Reserve? After all, who besides the U.S. government and other governments might have the money to take on so much risk in the gold and currency markets and who besides governments has the interest in doing so? Shown here is the BIS' statement of account for September, with the gold and gold derivatives line item highlighted. This two-month decline in gold derivatives trading by the BIS corresponded with a steadying of the gold price and then its substantial move up. That is, the more the BIS got out of the gold market, the higher the price went. Why is the BIS trading gold derivatives and for whom? Last year GATA put that question to the BIS. The BIS cordially explained that ... it doesn't explain what it does in the gold market, nor for whom. Other correlations involving the gold price in recent months also have implied interventions by governments and central banks. The top line on the chart tracks the gold price in U.S. dollars for the last two years. The bottom line on the chart tracks the gold price in Special Drawing Rights. The leveling and tightening of the gold price in SDRs in the bottom chart began when the IMF incorporated the Chinese yuan as a component of SDRs. Of course some central bank and government connections were officially announced over the last year. Russia has continued to buy gold in substantial amounts every month. Even Western-oriented governments like those in Poland, Hungary, and India recently announced purchases for their gold reserves as the United States increasingly has been "weaponizing" the dollar to coerce the world in trade and foreign policy. China doesn't regularly announce its gold purchases anymore but almost certainly has continued accumulating. Perhaps the most interesting item on the seminar's agenda is "gold market operations and accounting for gold." So central banks are in the gold market after all, but what are they doing with their operations? They're certainly not accounting much for them. Of course only central bankers and other government officials are invited to attend the World Gold Council's seminar in Singapore. The public and the markets aren't supposed to know what central banks do in the gold market. The public and the markets aren't supposed to know even what the World Gold Council is helping central banks and governments to do in the gold market. Not even gold investors themselves are supposed to know what the World Gold Council is telling central bankers about gold. Because control of the gold price is the prerequisite for control of the markets and control of all capital, labor, goods, and services in the world, the location and disposition of national gold reserves are secrets more sensitive than the location and disposition of nuclear weapons. For nuclear weapons can only destroy the world. By determining currency values and interest rates, gold can control the world. But maybe the most important development in gold market manipulation over the last year is that it is increasingly being recognized and questioned at high levels, as indicated by the more frequent purchases by central banks. Over the last year GATA has peppered central bank and government officials with questions they won't answer. GATA hopes that mainstream news organizations, fund managers, and governments will take notice. The mainstream news organizations are as timid and useless as the monetary metals mining industry itself, but some fund managers and governments are watching and catching on. In June GATA questioned the U.S. comptroller of the currency about the explosion in the use of a supposedly emergency mechanism called "exchange for physicals" to settle gold and silver futures contracts on the New York Commodities Exchange. Suddenly the delivery of hundreds of tonnes of metal purportedly was being shifted off the exchange to somewhere else, presumably London. So where were those metal deliveries coming from and what were the financial risks for the investment banks that had sold the futures contracts -- banks regulated by the comptroller of the currency? So increasingly the "exchange for physicals" mechanism seems to be cover for accounting fraud. "Can you say if this remains the case and if the bank's clients in trading the monetary metals markets include governments and central banks?" MorganChase did not even acknowledge GATA's inquiry. Of course MorganChase might have to acknowledge such an inquiry if it ever came from The Wall Street Journal, Bloomberg News, or even a gold or silver mining company. Fortunately for MorganChase, the Journal and mining companies are not interested in the manipulation of the monetary metals markets. In July GATA wrote to each member of the Commodity Futures Trading Commission about the huge new use of the "exchange for physicals" mechanism to settle gold and silver futures contracts. GATA asked for an explanation from the CFTC about what is happening with the mechanism. GATA also asked the commissioners about the tight correlation then prevailing between the gold price and the Chinese yuan. Was the U.S. government, GATA asked, allowing a foreign government to control the price of a commodity whose trading is regulated by the CFTC? But now questions about surreptitious government intervention in the markets may become harder to ignore. For a member of Congress, U.S. Rep. Alex Mooney, Republican of West Virginia, has drawn on GATA's research and is asking the Federal Reserve and the Treasury Department to explain what they may be doing in the gold market and other markets. Mooney cited documentation from the U.S. State Department archive, documentation provided by GATA, showing that U.S. policy long has been to drive gold out of the world financial system. Mnuchin replied through the Treasury's acting assistant secretary, Brad Bailey. Powell replied directly. But neither acknowledged and answered Mooney's policy question. What are the U.S. government's objectives with gold? The Treasury's reply denied that the department trades gold through the Bank for International Settlements, Bank of England, and other central banks or governments. Powell's reply denied any involvement by the Fed with gold swaps. Mooney's new letter also calls attention to the admission to GATA in 2009 by Fed Governor Kevin M. Warsh that the Fed has secret gold swap arrangements with foreign banks and insists on keeping them secret. Mooney's new letter asks Powell for an explanation of what seems like Powell's contradiction of the Fed's own records. Mooney's new letter also asks if the Treasury trades gold through its Exchange Stabilization Fund, through any other government agency, or through commercial banks and brokers. Mooney's new letter also notes the recent close correlation of the gold price with the Chinese yuan and the valuation of the International Monetary Fund's Special Drawing Rights. The congressman echoes the question GATA recently put to the CFTC without result. Mooney writes: "Do these correlations reflect surreptitious intervention in U.S. currency markets by China and currency manipulation by China? What do the Fed and Treasury think of these correlations?" Perhaps most satisfying for believers in free markets and limited and transparent government, Mooney now has asked the Treasury and Fed to come clean about everything. Mooney wrote: "What markets, if any, are the Fed and Treasury trading in, and through what mechanisms? If the Federal Reserve and Treasury are engaged in trading, what is the objective?" Mooney's latest letter to the Fed and the Treasury was sent July 27. More than three months have passed and the Fed and Treasury have not yet replied. All this information has been dutifully provided by GATA to major financial news organizations in North America and Europe. Last November in London I managed to get 45 minutes with a reporter for the Financial Times at the newspaper's headquarters. I provided him with the major documentation of market rigging by government that was available then, and since then I have often updated him by e-mail. While the Financial Times has done nothing with GATA's information, the newspaper HAS more or less explained why it won't touch the story of market rigging by government. Authers' column was headlined "In a Crisis, Sometimes You Don't Tell the Whole Story." He wrote that during the financial crisis of 2008 he was working for the FT in New York and came upon a bank run at Citibank and Chase Bank in Manhattan, with nervous depositors -- people from the financial industry -- rushing to withdraw money from their accounts. Authers wrote that when he got to the front of the line at Citibank, he found a helpful manager who explained that instead of withdrawing money, Authers should just transfer some money by opening additional accounts in the names of family members. This would increase his coverage by government deposit insurance. The manager, Authers wrote, explained that Chase was encouraging people to do the same thing being done at Citibank. Authers wrote: "Using bullet points, she asked if I was married and had children. Then she opened accounts for each of my children in trust, and a joint account with my wife. In just a few minutes I had quadrupled my deposit insurance coverage. I was now exposed to Uncle Sam, not Citi. With a smile she told me she had been doing this all morning. Neither she nor her friend at Chase had ever had requests to do this until that week. "I was finding it a little hard to breathe. There was a bank run happening, in New York's financial district. The people panicking were the Wall Streeters who best understood what was going on. "All I needed was to get a photographer to take a few shots of the well-dressed bankers queueing for their money, and write a caption explaining it. "We did not do this. Such a story on the FT's front page might have been enough to push the system over the edge. Our readers went unwarned, and the system went without that final prod into panic. "Was this the right call? I think so. All our competitors also shunned any photos of Manhattan bank branches. The right to free speech does not give us a right to shout fire in a crowded cinema; there was the risk of a fire, and we might have lit the spark by shouting about it. A few weeks later the deposit protection limit was raised from $100,000 to $250,000 via an emergency economic stabilization bill passed by Congress." Remarkably Authers admits in this column that he took care of himself but left his readers exposed until, weeks later, government took care of them by increasing deposit insurance. Would disclosure of surreptitious government intervention in the gold market and other markets collapse the world financial system? The Financial Times and all other mainstream financial news organizations seem to think so. But what if that financial system is built on fraud and deceit? Does such a system really deserve protection by news organizations? This system is really a policy of suppressing all commodity prices comprehensively, through the shorting of commodities in the futures markets, creating a vast imaginary supply of commodities, thereby supporting Western government currencies, government bonds, and other financial assets. This system has destroyed the free and transparent markets the West purports to advocate. It is also exploiting and impoverishing the commodity-producing developing world. So the rest of the world, especially the commodity-producing developing world, may prefer the policy expressed by the old legal maxim in Latin: Fiat justitia ruat caelum. That is, "Let justice be done though the heavens fall."